The manifold absolute pressure sensor, which is also known as the MAP sensor is an integral part of the vehicle’s engine system. The MAP sensor is found in fuel injected vehicles, and the primary job of the MAP sensor is to provide the Powertrain Control Module (PCM/ECM) with information about the pressure inside the intake manifold. Like any sensor inside your vehicle, the MAP sensor does get worn out and gets damaged over the time and may result in transmitting incorrect data to the engine control unit. This incorrect information can cause result in lower performance, drop in fuel economy and several other consequences. In this article, we will discuss some of the key symptoms you will experience when the manifold absolute pressure (MAP) sensor becomes faulty and starts to malfunction. Any problem with the manifold absolute pressure sensor (MAP) results in improper combustion which can cause damages to the engine and disrupt the performance. Here are some common symptoms you will experience if you have a damaged manifold absolute pressure (MAP) sensor. 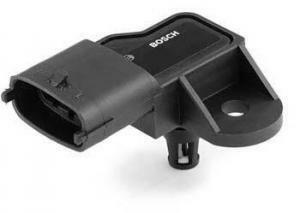 When the manifold absolute pressure (MAP) sensor is damaged, it can send an incorrect signal to the powertrain control module (PCM) indicating that there is a high load on the engine. This will cause the PCM to release extra fuel into the cylinder and also release emission of gasses such as carbon monoxide. One of the simplest way to determine if you have a faulty MAP sensor is to take your car for an emission test. A vehicle emission test will find out if the car is producing an excessive amount of carbon monoxide and hydrocarbon which will help in determining that there is some problem with the MAP sensor. A faulty manifold pressure sensor which measures low intake manifold pressure will transfer this information of low engine load to the PCM. As a result, the PCM will reduce the amount of fuel which is to be injected into the engine. In such a case, you will notice an improvement in fuel efficiency. However, there would be a significant drop in the performance. When you have a bad MAP sensor, the engine sometimes runs lean, which will cause the combustion to fail. This can result in detonation which produces a pinging or a knocking sound. The detonation can prove to be fatal as well and will require you to rebuild the engine. A malfunctioning map sensor causes the RPM to drop significantly because of a faulty fuel mixture, which makes the vehicle surge at low speed. Turning on the air conditioning system will make the situation worse, and the engine will die out suddenly. A faulty MAP sensor will also cause problems when starting the car. The vehicle’s onboard computer uses the MAP sensor to determine atmospheric pressure before starting the engine. An incorrect reading may cause a small amount of fuel to be delivered to the engine, and as a result, the engine may not start at all. The MAP sensor is among the main sensors that are present inside the electronic control unite of the combustion engine. Typically, the MAP sensors are current in the fuel injected engines. The MAP sensor is responsible for generating and transmitting the sensed information on the instantaneous manifold pressure to the electronic control system of the engine. The control unit then uses the computerized approach and the stoichiometric applications to manipulate and interpret the sensed data to determine the air density and the air mass flow rate of the engine. These parameters are essential for the optimal engine performance as they can help the engine system determine the acute fuel metering to accomplish optimum combustion. As a result, it helps the engine control unit to automatically regulate the precise timing of the ignition which can improve the engine performance and fuel efficiency. 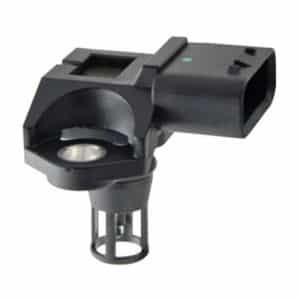 The MAF or mass airflow sensor can also be used to sense and record the same information on the intake airflow of the engine in the fuel injected engines in combination with the MAP sensors. The data that is generated by the MAP sensors can be transformed into air mass data with the speed density approach. The data from other sensors are also used to carry out these calculations. For instance, the control unit may use the data generated by other sensors such as the air temperature and RPM to calculate the air mass flow rate and the air density as these are the dependent factors. Usually, in most vehicles, the MAP sensor is installed within the intake manifold, air cleaner, firewall, under the dash or the fender wall. It may be located below the headlight assembly of the passenger side in the outlet flange of the intercooler. 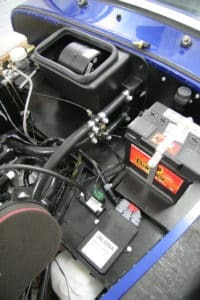 The map sensor location depends on the design of your vehicle, and its best to refer to the service manual for finding the position of the MAP sensor in your car. You can visit an auto specialist for MAP sensor servicing, or you can perform the same procedure at home as well with the following steps. For newbies, locating the MAP sensor can be a tough job which is why it is useful if you have the vehicle’s owner manual. You can easily find the location of each sensor including the MAP sensor from the owner’s manual. In general, the MAP sensor can be found near the intake manifold and remove the wire harness can provide better visibility. Make sure the vehicle is switched off, and the keys are not in the ignition to avoid the risk of damaging sensitive electric parts. Once the sensor is located, remove the connector plug then gently squeeze the tab holding the sensor in its place. You might need a screwdriver to remove some screws securing the sensor. Next step is to clean the sensor gently with an electric parts cleaner. You can easily find an electronic parts cleaner at an auto store. Spray the cleaning solvent on a clean cloth and gently rub around the sensor. Once you are done with the cleaning, leave the sensor to dry and ensure that no liquid residue is present. When you are sure that the MAP sensor is thoroughly dry, install it back into the place and attach the screws and the plug. Close the hood and you are done. The average cost for MAP sensor replacement is around $120 and $190. The labor cost comes about $30 and $70, while the sensor itself costs between $100 and $120 depending on the model and make. You can also perform the replacement procedure at home. However, the process is risky, and you may end up damaging some other electrical component. It is advisable to take the cost estimation from an auto specialist and choosing the best one. A bad or failed MAP sensor can cause you to fail the emission test and lose more money on the extra fuel your vehicle will consume in the long run. Here is a brief account on the step by step guide for replacement of the MAP sensor of your vehicle. Take a test drive to make sure that the problem is fixed. If the problem persists, take your vehicle to a mechanic. The diagnosis of the bad or failed MAP sensor can be performed by first observing the symptoms that are expressed in your vehicle and then carrying out a physical test as a diagnostic procedure. To do that, here is a brief step by step guide that you can follow to check, test and diagnose if the MAP sensor of your vehicle has gone bad. Check if the check engine light is turned on. Observe if your engine is pinging. See if the acceleration of your engine is affected. See if your car is frequently going on a limp-home mode feature. Check to see if the connections and the electrical wires are in good condition. Determine the frequency type, voltage and the type of MAP sensor that is installed in your vehicle by checking yourself or referring to the service manual provided by the manufacturer. For the frequency type MAP sensor, you will be using the tachometer for the diagnosis. If there is a problem, install everything that you removed and take your car to the mechanic for advanced diagnosis. For the frequency type MAP sensor, you will use a tachometer with the voltmeter. On 20 in-Hg vacuum pressure, the voltage reading should be around 1.1 volts. Make sure that you use the service manual to see if your vehicle uses the same readings.